For other uses, see Superhero (disambiguation). A superhero (sometimes rendered super-hero or super hero or Super) is a type of heroic stock character, usually possessing supernatural or superhuman powers, who is dedicated to fighting the evil of their universe, protecting the public, and usually battling supervillains. A female superhero is sometimes called a superheroine (also rendered super-heroine or super heroine), although the word superhero is also commonly used for females. Superhero fiction is the genre of fiction that is centered on such characters, especially in American comic book and films since the 1930s. Some superheroes use their powers to counter daily crime while also combating threats against humanity from supervillains, who are their criminal counterparts. Often at least one of these supervillains will be the superhero's archenemy. Some long-running superheroes and superheroines such as Mr. Incredible, Superman, Spider-Man, Batman, Wonder Woman, the Hulk, Green Lantern, the Flash, Captain America, Thor, Wolverine, Iron Man and the X-Men have a rogues gallery of many villains. There are movies and TV shows featuring various super heroes. Fox Feature Syndicate's 1930s–1940s superhero the Flame. Pérák was an urban legend originating from the city of Prague during the German occupation of Czechoslovakia in the midst of World War II. 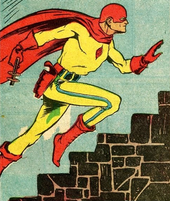 In the decades following the war, Pérák has also been portrayed as the only Czech superhero in film and comics. The 1950s saw the Silver Age of Comics. During this era DC introduced the likes of Batwoman in 1956, Supergirl, Miss Arrowette, and Bat-Girl; all female derivatives of established male superheroes. In 1957 Japan, Shintoho produced the first film serial featuring the superhero character Super Giant, signaling a shift in Japanese popular culture towards tokusatsu masked superheroes over kaiju giant monsters. Along with Astro Boy, the Super Giant serials had a profound effect on Japanese television. 1958 saw the debut of superhero Moonlight Mask on Japanese television. It was the first of numerous televised superhero dramas that would make up the tokusatsu superhero genre. Created by Kōhan Kawauchi, he followed-up its success with the tokusatsu superhero shows Seven Color Mask (1959) and Messenger of Allah (1960), both starring a young Sonny Chiba. The 1970s would see more anti-heroes introduced into Superhero fiction such examples included the debut of Shotaro Ishinomori's Skull Man in 1970, Go Nagai's Devilman in 1972 and Gerry Conway and John Romita's Punisher in 1974. Most dictionary definitions and common usages of the term are generic and not limited to the characters of any particular company or companies. Nevertheless, variations on the term "Super Hero" are jointly claimed by DC Comics and Marvel Comics as trademarks. Registrations of "Super Hero" marks have been maintained by DC and Marvel since the 1960s, including U.S. Trademark Serial Nos. 72243225 and 73222079. In 2009, the term "Super Heroes" was registered as a typography-independent "descriptive" US trademark co-owned by DC and Marvel. Both DC Comics and Marvel Comics have been assiduous in protecting their rights in the "Super Hero" trademarks in jurisdictions where the registrations are in force, including the United States, the United Kingdom, and Australia, and including in respect of various goods and services falling outside comic book publications. Certain established characters have had their ethnicity changed when adapted to another continuity or media. A notable example is Nick Fury, who is reinterpreted as African-American both in the Ultimate Marvel as well as the Marvel Cinematic Universe continuities. Many new openly gay, lesbian and bisexual characters have since emerged in superhero fiction, such as Gen¹³'s Rainmaker, Apollo and Midnighter of The Authority, and Wiccan and Hulkling of the Young Avengers. Notable transgender or gender bending characters are fewer in number by comparison: the alter ego of superheroine Zsazsa Zaturnnah, a seminal character in Philippine popular culture, is an effeminate gay man who transforms into a female superhuman after ingesting a magical stone. Desire from Neil Gaiman's The Sandman series, Cloud from Defenders, and Xavin from the Runaways are all characters who could (and often) change their gender at will. Alysia Yeoh, a supporting character created by writer Gail Simone for the Batgirl ongoing series published by DC Comics, received substantial media attention in 2011 for being the first major transgender character written in a contemporary context in a mainstream American comic book. An animated short The Ambiguously Gay Duo parodies comic book superheros and features Ace and Gary (Stephen Colbert, Steve Carell). It originated on The Dana Carvey Show and then moved to Saturday Night Live. In 2017, Pluin introduced Sign Gene, a film featuring a group of deaf superheroes with supernatural powers through the use of sign language. The film was produced by and with deaf people and nurtures the culture's self image by reflecting correctly the core of the Deaf culture, history and language. ^ Niccum, John (March 17, 2006). "'V for Vendetta' is S for Subversive". Lawrence Journal-World. Lawrence, Kansas. Archived from the original on November 14, 2013. ^ Gesh, Lois H.; Weinberg, Robert (2002). "The Dark Knight: Batman: A NonSuper Superhero". The Science of Superheroes (PDF). John Wiley & Sons. ISBN 978-0-471-02460-6. Archived (PDF) from the original on November 19, 2014. ^ a b "Superhero - Definition and More from the Free Merriam-Webster Dictionary". Web.archive.org. Archived from the original on November 5, 2014. Retrieved March 26, 2016. ^ a b Packer, Sharon (2009). Superheroes and Superegos: Analyzing the Minds Behind the Masks. Greenwood Publishing Group. p. 52. ISBN 978-0313355363. ^ Lovece, Frank (November 11, 2013). "Superheroes Go the American Way on PBS". Newsday. New York / Long Island. Archived from the original on February 22, 2014. Retrieved November 15, 2013. ^ "Who was the first superhero?". Web.archive.org. Archived from the original on March 30, 2012. Retrieved March 26, 2016. ^ "First superhero ever in the world. Mandrake the Magician Lee Falk Popeye the Sailor Man Superman". Thelongestlistofthelongeststuffatthelongestdomainnameatlonglast.com. February 17, 1936. Retrieved March 26, 2016. ^ a b c "The Golden Age Of Comics". www.pbs.org. Retrieved January 11, 2018. ^ Markstein, Don. "The Black Widow". Don Markstein's Toonopedia. Archived from the original on April 15, 2012. Retrieved July 26, 2013. Fantomah was the first female character in comics to use extraordinary powers in combatting evil. The Woman in Red was the first to wear a flashy costume and maintain a dual identity while doing so. On the other hand, The Black Widow was the first to do both. ^ Fantomah, Mystery Woman of the Jungle at Don Markstein's Toonopedia. Archived from the original on January 29, 2015. ^ Heintjes, Tom (May 11, 2012). "Not Seen but not Forgotten: The Invisible Scarlet O'Neil". Hogan's Alley (17). Archived from the original on June 12, 2013. ^ "GCD :: Issue :: Thrilling Comics #v1#2 (2)". Comics.org. January 11, 1940. Retrieved March 26, 2016. ^ "Don Markstein's Toonopedia: Miss Fury". Toonopedia.com. April 6, 1941. Archived from the original on April 9, 2012. Retrieved March 26, 2016. ^ "Don Markstein's Toonopedia: The Black Cat". Toonopedia.com. Retrieved March 26, 2016. ^ Lamb, Marguerite (Fall 2001). "Who Was Wonder Woman?". Bostonia. Archived from the original on January 19, 2007. ^ Malcolm, Andrew H. (February 18, 1992). "OUR TOWNS - She's Behind the Match For That Man of Steel - NYTimes.com". New York Times. Retrieved March 26, 2016. ^ Takeshobo, ed. (1995-11-30). "BonusColumn「変身ブーム到来! !」" [Bonus Column 'The Henshin Boom Arrives!']. 超人画報 国産架空ヒーロー四十年の歩み [The Super Heroes Chronicles: The History of Japanese Fantastic Televisions, Movies and Videos, 1957-1995] (in Japanese). Takeshobo. p. 85. ISBN 4-88475-874-9. C0076. ^ W. Wright, Bradford (2001). Comic Book Nation: The Transformation of Youth Culture in America. United States: The Johns Hopkins University Press. p. 250. ISBN 0-8018-6514-X. Retrieved December 29, 2014. ^ Kristiansen, Ulrik; Sørensen, Tue (May 1, 1996). "An Interview with Chris Claremont". Comic Zone. Archived from the original on September 28, 2007. ^ Sunu, Steve (January 14, 2013). "Wood and Coipel Mutate "X-Men" for Marvel NOW!". Comic Book Resources. Retrieved January 14, 2013. ^ By Maria Aspan. "What We Learned About Power From Buffy the Vampire Slayer". Inc.com. Retrieved March 26, 2016. ^ Name *. "From Darna To Zsazsa Zaturnnah: Desire And Fantasy « Anvil Publishing, Inc". Anvilpublishing.com. Archived from the original on March 4, 2016. Retrieved March 26, 2016. ^ "Darna ha ha ha!". Philippine Daily Inquirer. February 17, 2003. Retrieved July 19, 2014. ^ "Can Sailor Moon Break Up the Superhero Boys Club?". The Atlantic. Retrieved July 19, 2014. ^ "Sailor Moon superhero may replace Power Rangers". Ludington Daily News. Retrieved July 19, 2014. ^ Sailor Moon (superhero). The Superhero Book: The Ultimate Encyclopedia of Comic Book Icons. January 1, 2004. ISBN 9781578591541. Retrieved July 19, 2014. ^ "Moon Prism Power! Why Sailor Moon is the perfect female superhero". Leslie IRL. Archived from the original on February 23, 2014. Retrieved July 19, 2014. ^ Comella, Anthony. "Grrrl power: why female superheroes matter". Pop Mythology. Retrieved July 19, 2014. ^ Ulaby, Neda (March 27, 2006). "Comics Creators Search for 'Super Hero' Alternative". All Things Considered. NPR. Archived from the original on September 22, 2013. ^ Marvel Characters, Inc.; DC Comics; United States Patent and Trademark Office (November 16, 2004). "Trademark Status & Document Retrieval". United States Patent and Trademark Office. Retrieved October 30, 2013. US Serial Number: 78356610 [...] Standard Character Claim: Yes. The mark consists of standard characters without claim to any particular font style, size, or color. ^ a b Stewart, DG (June 1, 2017). ""The "Superhero" Trademark: how the name of a genre came to be owned by DC and Marvel, and how they enforce it"". World Comic Book Review. Retrieved June 20, 2017. ^ Coleman, Ron (March 27, 2006). "SUPER HERO® my foot". Likelihood of Confusion. Archived from the original on July 22, 2014. ^ Doctorow, Cory (March 18, 2006). "Marvel Comics: stealing our language". Boing Boing. Archived from the original on August 18, 2014. ^ Dowling, Jennifer (May 7, 2009). 'Oy Gevalt': A Peek at the Development of Jewish Superheroines. The Contemporary Comic Book Superhero. UK. ISBN 9781135213930. Retrieved August 22, 2015. ^ a b "Sign Gene by Emilio Insolera arrives at cinema". ASVOFF. September 10, 2017. ^ "Red Wolf (Old West, Johnny Wakely)". Marvunapp.com. Retrieved March 26, 2016. ^ Kim, Jonathan (January 15, 2011). Why The Green Hornet's Kato Matters. The Huffington Post. Retrieved August 22, 2015. ^ Kaplan, Arie (2008). From Krakow to Krypton: Jews and Comic Books. The Jewish Publication Society. p. 120. ISBN 978-0827608436. In Uncanny X-Men #129 cover-dated Jan. 1979 and on sale in late 1978, writer Chris Claremont and the artist John Byrne created Katherine "Kitty" Pryde, aka Shadowcat, a young Jewish girl who possess the mutant ability to walk through walls. ^ Lynskey, Dorian (March 25, 2015). "Kapow! Attack of the feminist superheroes". The Guardian. UK. Archived from the original on August 19, 2015. ^ Kawasaki, Anton. "Northstar – GAY LEAGUE". Gayleague.com. Retrieved March 26, 2016. ^ Hick, Darren. "The Comics Journal Performs a Public Service". The Comics Journal. Archived from the original on October 5, 2009. ^ "Entertainment | Batwoman hero returns as lesbian". BBC News. May 30, 2006. Retrieved March 26, 2016. ^ Neuman, Clayton (June 4, 2006). "Caped Crusaders". TIME. Retrieved March 26, 2016. ^ Hanks, Henry (April 22, 2015). "'X-Men' character Iceman outed as gay". CNN.com. Retrieved March 26, 2016. ^ "The return of Zsazsa Zaturnnah | Inquirer lifestyle". Lifestyle.inquirer.net. Retrieved March 26, 2016. ^ Kane, Matt (April 10, 2013). "'Batgirl' Comic Introduces Transgender Character". GLAAD. Retrieved March 26, 2016. ^ "Intersections: Male Homosexuality and Popular Culture in Modern Japan". She.murdoch.edu.au. Retrieved March 26, 2016. ^ "Sailor Neptune and Uranus Come Out of the Fictional Closet". Huffington Post. May 21, 2014. ^ Trigari, Michela (September 12, 2017). "Sign Gene è il nuovo film di supereroi sordi" (in Italian). Corriere della Sera. ^ "Quando il super eroe è sordo" (in Italian). Avvenire. September 10, 2017. William Irwin (ed. ), Superheroes: The Best of Philosophy and Pop Culture, Wiley, 2011.